In a recent note I explained how to get these crucial Hurricane Advisory reports underway using email request to saildocs. For completeness, we should also look at the primary source for getting the same information directly from the NWS using ftpmail. I am reminded to do this because I just discovered that there is an excellent presentation of the ftpmail service in the back section of the NWS publication on radio fax schedules (rfax.pdf), and you would not guess that from the title—in fact, you would not guess it from the Table of Contents, either, because it is in Appendix B, and there is no Appendix B in the Contents. Nevertheless, it is there and it is very helpful. So with this document you not only get the latest HF frequencies and broadcast schedules for conventional HF FAX weather map transmissions, you also get the ftpmail instructions with interactive links, as well as a long list of other marine weather resources. It appears they have updated this pdf with regard to the HF schedules and it does have a table of contents for the fax schedules, but not much mention of the FTP mail part at the back. At one point we made a custom book of these instructions, but they then changed all the links... so we give up on that approach. Best is to just find and use the appendix referenced above. Note that even though this file has changed a lot over the years, the name has always reminded the same, ie rfax.pdf. So changes are you can find it from that alone on Google even if they move it once again. OPC has warned us they are changing all links again at the end of Aug, 2017. This is an important program to know about and test using. It includes essentially all NWS products, both maps and text—for local waters as well as oceans. For some graphic map products, saildocs still has the advantage as they reduce them by a factor of 2 before sending, so this is a big factor for sat phone communications. But saildocs do not offer all the maps that are available, so we need the ftpmail service. We have made another convenient pdf for getting either the larger size maps from NWS directly or by email request to saildocs for the reduced file size. The unforgivable red arrows on this map mark two entirely different things. The horizontal ones show the directions of motion of the Lows; the down bound ones are associating the text notice with the systems they refer to. The NWS tells us to see the Advisory, because they know that no map they make, nor any map that anyone makes, will tell us what we need to navigate in the vicinity of the path of these storms. (We do have a cyclone danger area map available by rfax, but it does not layout the winds). We also know that the grib formatted GFS forecasts for these systems are not dependable, especially in the early days of formation... and we have to interpret "not dependable" as including "very wrong." So it is crucial that we know how to get these Advisories underway.... and we can, once again, be very grateful for the wonderful services of saildocs.com, as they will send them to us promptly with an easy request—though we should keep in mind that saildocs is just tapping into the NWS's long established FTPmail program, which is the primary source. Then in a few minutes you will get 6 emails back, all small text only. The first is an overview with some TC data covering all of Metarea 12. The second is the forecasters discussion of what they forecasted. The data for Metarea 12 is given in 3 separate parts in the text file. The "4" in the next requests identify the 4th Pacific storm of the season, which is Celia. Blas is #3, and the next is Darby, #5. Change this number in the request to the number of the storm you are following. The last two requests (Central Pacific) are only needed if you and the storm are west of 140W. It is worth sending that email now to see what you get. You can cut and paste the above request lines, then remove any signatures that come up. Here is what you get in the tech_advis report looks like for Celia, storm #4 of the 2016 Eastern Pacific season. Note that each Advisory has a number so it is easy to keep track of what you have. They are issued every 6h. 34 KT....... 80NE 60SE 60SW 80NW. 12 FT SEAS..140NE 60SE 60SW 110NW. 34 KT...100NE 70SE 70SW 100NW. 34 KT...110NE 80SE 80SW 110NW. 64 KT... 35NE 25SE 25SW 35NW. 34 KT...120NE 100SE 90SW 120NW. 50 KT... 60NE 50SE 50SW 60NW. 34 KT...130NE 100SE 90SW 120NW. (1) Plot these positions on the chart and also sketch in the quadrants marking the 34 kt wind zones for the next 2 days or so. (2) Plot the extended 34-kt radii using the Mariners 1-2-3 Rule that expands the radii by 100 nmi for each 24h of forecast. If the radius is 20 mile now, it should be extended to 120 nmi for tomorrow at this time, and 220 miles for the next day. (3) Then try to maneuver to avoid this extended regions (Mariners 34-kt rule). 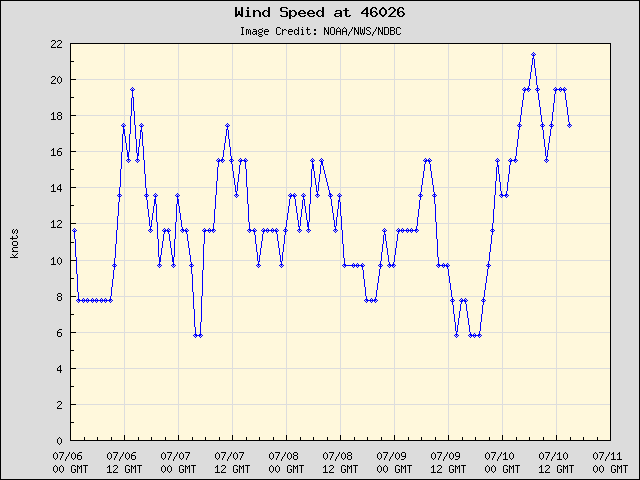 Note that the 34kt-wind Rule was designed for ships, so they obviously apply to small craft as well. It is not marking unmanageable conditions—experienced sailors can sail in 34 kt winds—but it is just a way to mark that region wherein the storm can change quickly either in direction or intensity. 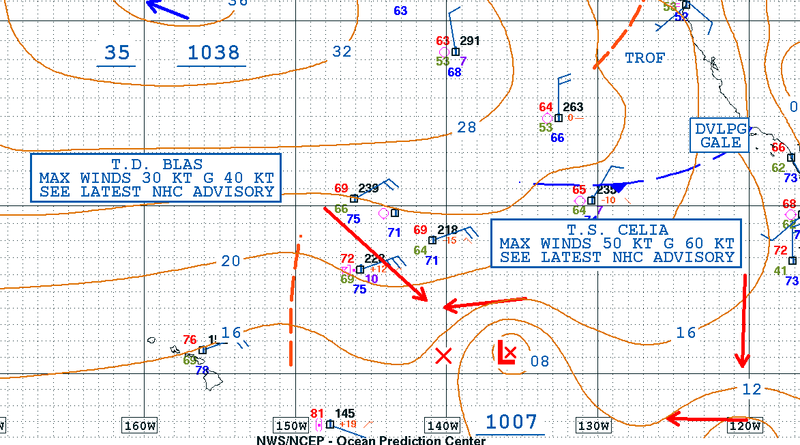 Staying out of that extended region (Mariners 1-2-3 Rule) is the recommended policy of both the NWS and the US Navy. We have seen tragic loss of life at sea in recent times because that rule was violated. 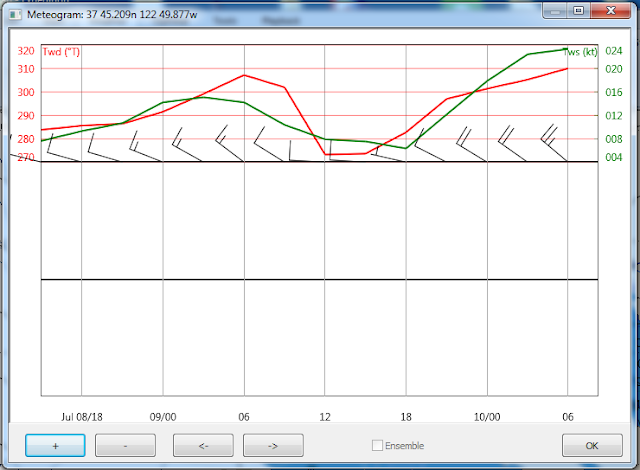 Here is a video example of applying these Advisories in the echart program Expedition. Deep back up for all of this are the HF time tic broadcasts that include storm warnings every hour. These can be received by a simple shortwave receiver. ...AND, of course, the NHC has a Twitter feed for the E. Pacific @NHC_Pacific, but i do not know yet how we might use that. It should be a useful way for fast info. Before the start any data available are legal, but after the start only free public data are legal. We compare here a couple numerical predictions using Buoy 46026, located 18 mi west of San Francisco, of interest, for example, for the start of the Pacific Cup, San Francisco to Kaneoe Bay, Oahu. We are basically testing here the forecasts made at 18z on July 7 to see how they pan out for a day or so, with a main goal to simply illustrate one way to test models when preparing for a race. These are both pictures captured from the NDBC site for Buoy 46026. To follow are the forecasts presented as metorgrams at the location of Buoy 46026 from Expedition. Note that this function defaults to presenting the full time span of data from the latest download, but you can then zoom it for better comparisons. So the procedure is, look at the wind speed and direction from the auto-updated pictures above and then look below to see how the models forecasted that back at 18z on Jul 7. HRRR ony goes hour 15h, so very good for that period, but then need something longer. The hi res regional models do not go out far enough to see this back at 18z on the 7th. They are intended to be run more frequently. Apply this for other cases you might care about. 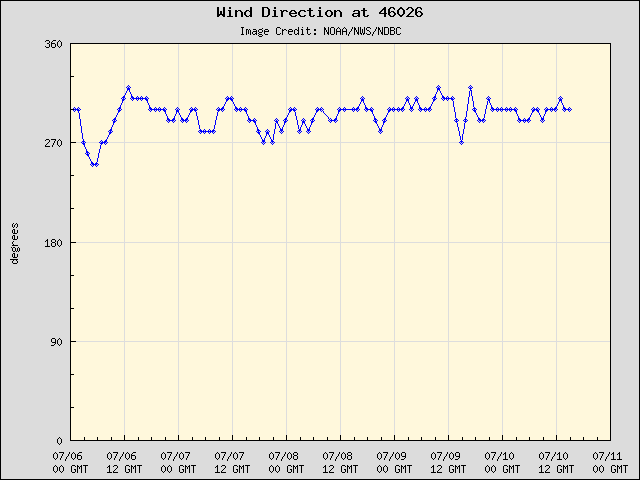 You can look at a buoy of your choice in the waters you care about at the NDBC site, and then load the various models in Expedition and just plot a meteogram at the buoy location and watch how the forecast pans out. Find buoy IDs at the ndbc site. ...and you will get back the data below, from which we see the models are pretty good, but NAM and GFS are off more than the others, and HRRR has timed out. Or you can subscribe to that and get it back every hour, or 3h etc. Best to check with saildocs on that procdure. This is an update of work done originally in 2012. We have used it in our classes but not published it. We revive it here with new examples and free apps for computation and experimentation with the solution. Details of the derivations are published in another format. The derivation applies to n LOPs with random and systematic variances. This example is three only, addressing the navigator's famous "cocked hat" problem. Position fixes in navigation are inevitably determined by the intersection of two or more lines of position (LOP). When there are more than two LOPs, they will intersect in multiple places, and it is the job of the navigator to decide which point on the plot to consider the most likely position based on these intersections and anything else that might be known about the measurements. The most common scenario is to have three judiciously chosen LOPs, each of which might be an average of several measurements. Practicing navigators have tended to choose the best position within the triangle of intersecting LOPs (cocked hat) as some central value of their choice, based on their experience and the actual sights at hand. In most cases this is an adequate solution, but in rare cases we might want to choose the best possible location based on all that we know about the three LOPs. These can be celestial sights, or they could be three compass or gyro bearing lines. More to the point, they could be two bearings of standard accuracy and a range line (transit) that can be a very accurate LOP, or equivalently, one very good celestial sight and two that were not as good due to poor horizon or fewer sights in the sequence. In short, if we are to apply more sophisticated analysis, we need to have enough extra data to justify it, including the individual uncertainties in each sight, assumed to be random errors that can be characterized in terms of a standard deviation—and we must keep in mind that there could be a constant systematic error that applies to each of the sights. It can be shown that if the standard deviations of the sights are all the same (no one LOP better than another), and there is no systematic error that applies to all of them, then the most likely position is located at what is called the symmedian point of the triangle, which is discussed at length at online math resources. 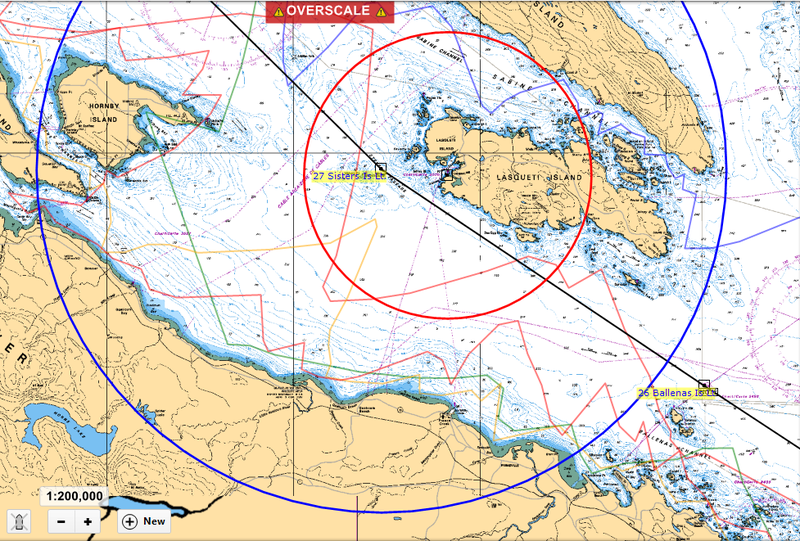 It is a bit tedious to plot this point, but worth noting that it is not any of the center points commonly used underway. These points can be quite different as the triangle becomes more acute (a poorer fix to begin with), but the overall assigned uncertainly is usually large enough to encompass this difference. Figure 1. Several center points of a triangle. Gray, the centroid, is the intersection of any two medians, vertex to center of the opposite side. Red, the incenter, is the intersection of any two bisectors of the angles. The symmedian point is the intersection of any two symmedians (S), found by reflecting the median lines (M) over the bisector lines (B). These points are discussed in the References at the end of this note. Once you are convinced that the standard deviations are not the same, then the symmedian point is no longer correct. 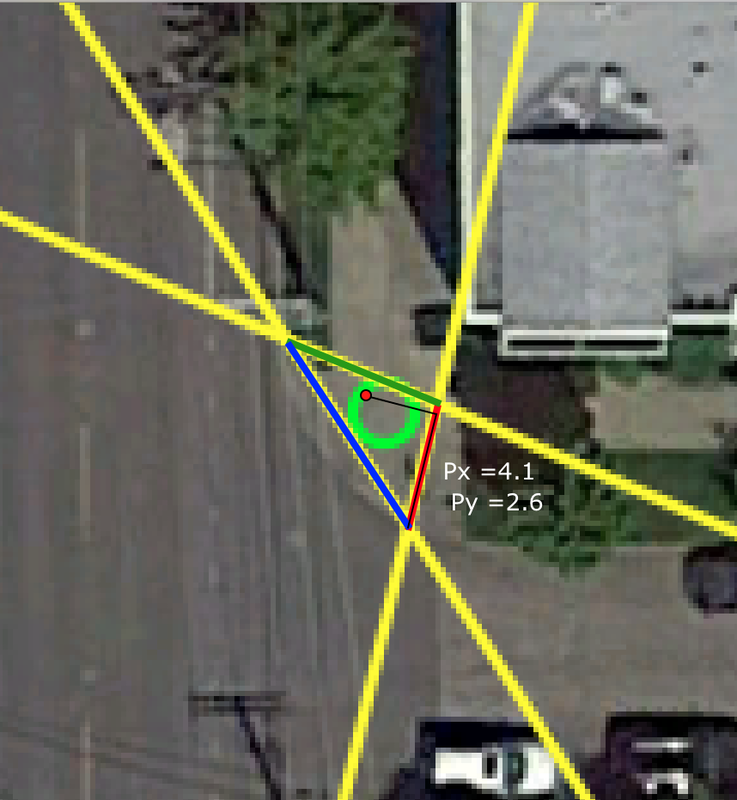 For example, if one line (of a terrestrial fix) is a navigational range (transit), then that should bias the fix toward that line, and the other two compass bearings are effectively just showing where you are on that line. where qi = si2 σi2 / Σ (sj2 σj2). In this formalism the most likely point is determined from the sides of the triangle (si) and the standard deviation of each line (σi) without reference to the intersection angles. Consider a sample triangle of sides 10, 9, and 13 that have corresponding standard deviations of 1, 2, and 3. The units are arbitrary, chosen for convenience of measurement on the nautical chart or plotting sheet in use. 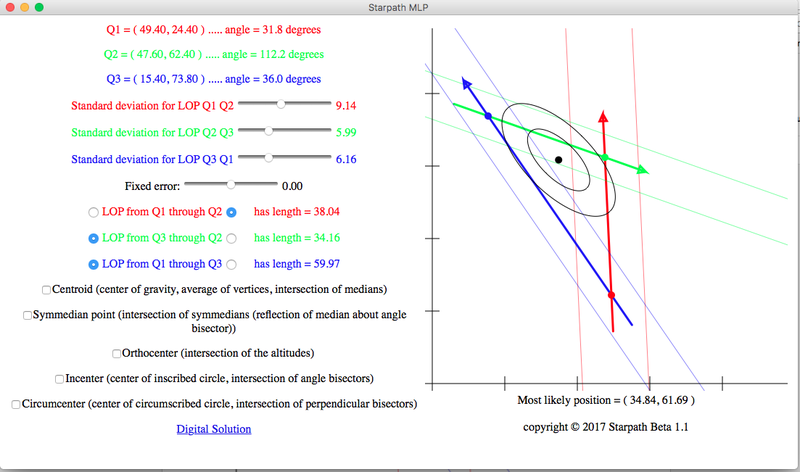 Once the LOPs have been plotted, it is the task of the navigator to assign a standard deviation ("sigma") to each of the LOPs. q3 = 1521/1945 = 0.782. This process may seem complex at first glance, but that is tied in large part to the compact notation. After working a few examples the procedure becomes more fluid. This is the first solution we have seen that offers a fast practical way to answer this question accounting for different standard deviations in the LOPs. Figure 2. 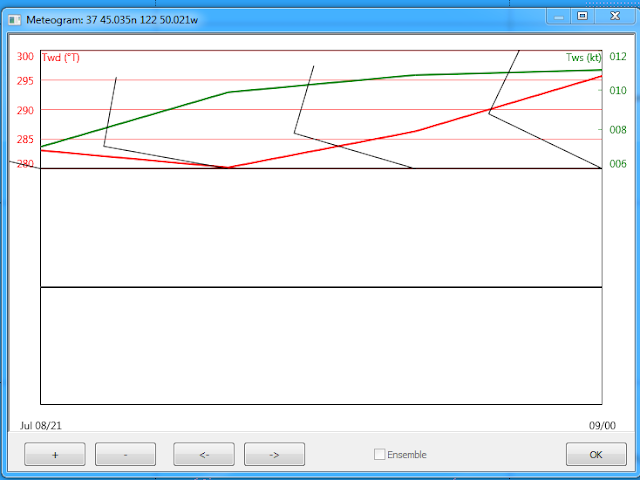 Most likely point P (6.7, 5.4) determined from three LOPs, without systematic error. 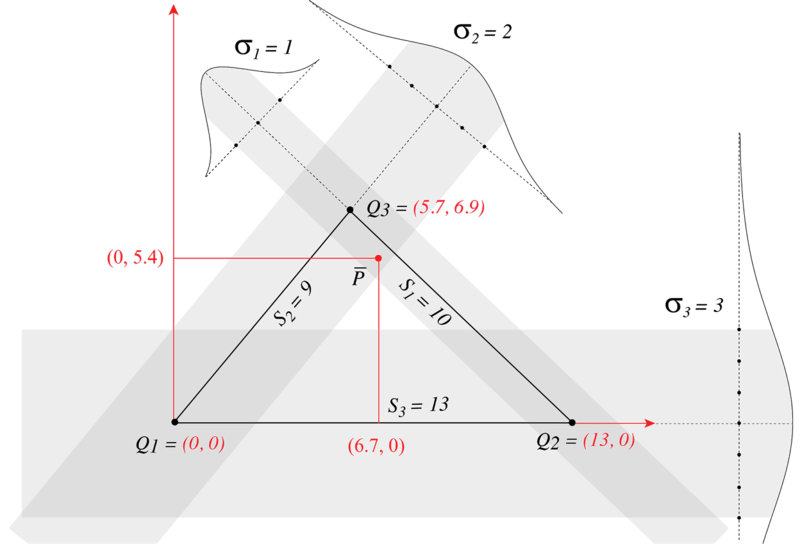 The standard deviation (sigma) of each LOP is shown schematically to match the units chosen to measure the sides of the triangle from the chart. If the units were miles, a choice of incircle or centroid (they are about the same in this triangle) would be wrong by 3 miles. First, we could compute the location of the answer P as Px, Py, relative to the x-axis that runs along the s3 side (Q1 to Q2) using either a form or a spreadsheet as shown in Figure 3. Figure 3. Spreadsheet for solving most likely position. With a blank form, we input the 3 sides and the 3 sigmas (yellow), then compute the A values and find B, the sum of these, then find the A/B values. 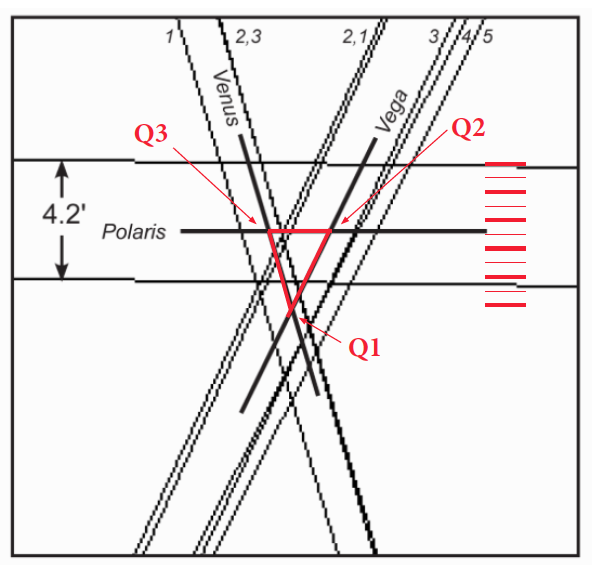 Doing it manually, we need to read or measure the location of Q3 (x3, y3), as shown in Figure 5. Note the x2 value is the same as s3, because with this approach we choose the x-axis along that line. Next we need to fill in the form with these quick multiplications and sums, and we end up with the answer Px, Py. Figure 4. Sample of the work form. The sample example is included as are optional ways that Px and Py show up based on the choice for Q1. On the other hand, with this computation in a spreadsheet or simple app the computations can be automated, and we just enter the three sides and three sigmas and then Px, Py are computed automatically. Here is a free Windows app you can use to check your manual solution. It just solves for Px, Py as outlined above. A few examples of finding MLP manually with the form are given below. The plots were made in a navigation program. Figure 5. Finding the x,y values of point Q3 of the example from Figure 2 using the divider tool in Expedition. Most navigation programs have a similar measurement or range and bearing tool. 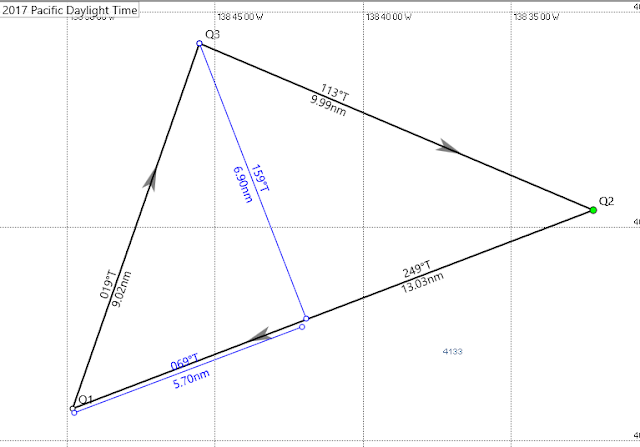 The triangle can be reproduced using the route tool. Figures 5 and 6 show how the above example could be solved on the screen of a navigation program, either from the actual LOPs, or a reproduced triangle using a route tool. Figure 6. 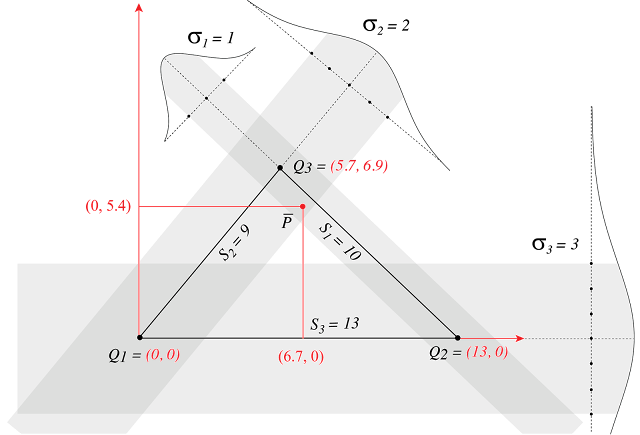 Plotting the most likely position (Px,Py) using the divider tool. Below is an example of a cel nav fix with unequal standard deviations. 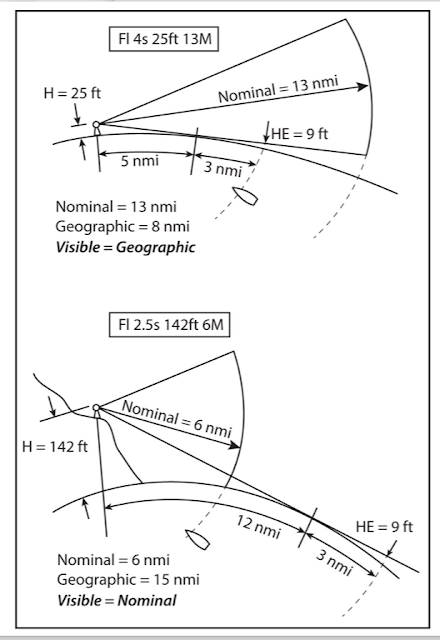 It is one of some 160 fixes carried out on a 1982 ocean voyage by cel nav alone, documented in the book Hawaii by Sextant (HBS). Figure 7. Celestial fix from 5 sights of Vega, 3 sights of Venus, and 2 sights of Polaris. The estimated sigmas based on the spread of the sights is given in Figure 7. The 3 LOPs selected for the fix were based on the fit slope method, described in the book. The length of the sides were based on the separation of the two Polaris sights, 4.2' = 4.2 nmi. The data from these sights are presented in the the figure below, and then the position is plotted. Figure 8. Data for the 3 LOPs of Figure 6. Figure 8. Expanded plot of Figure 7 with the MLP plotted as a green circle. The result is as might be expected, but definitely not the centroid nor the symmedian, which would be off by about 1 mile. 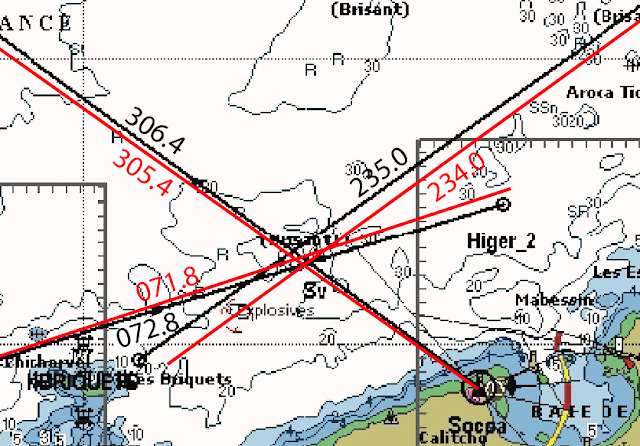 The fix is forced to the Venus line, which was very good, i.e., ±0.7' (approximately nautical miles), which is about as good as we can expect for cel nav, and then favoring the Venus-Vega intersection. The Polaris sight only served to pull the fix off of that intersection. Note, too, that the fit-slope method we recommend in our cel nav training is crucial to this type of analysis. Here is another example, also from HBS, with a link to the background to getting the best triangle from the raw data. 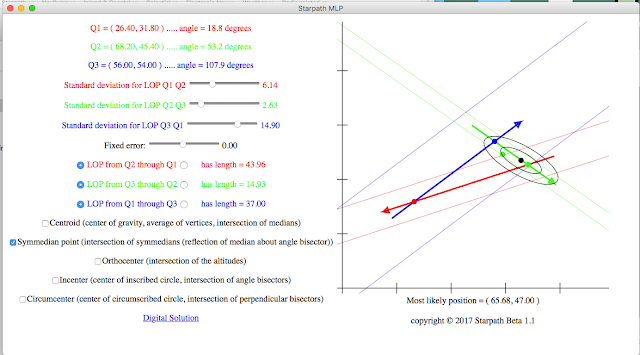 See Analysis of a Celestial Navigation Sight Session, which shows what we need to do before we ask for MLP. Figure 9. Plot of Altair-Vega-Jupiter fix. The vertical scale is in miles. We see Q3 (2.5, 1.5) and MLP (1.9, 1.5) plotted. Figure 10. MLP for Altair-Vega-Jupiter fix using our interactive MLP app (see download links, end of this note). 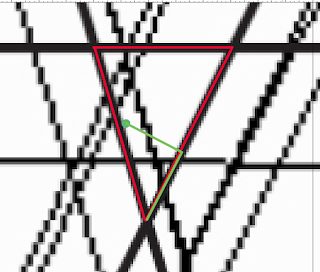 Just drag the corners of the triangle for different shapes, and add sigma and fixed errors digitally. The ellipses mark the 50% and 90% confidence distributions centered on the most likely position. Once a fixed systematic error is applied to all sights, the direction of the LOPs makes a difference, which accounts for the arrowheads on the LOPs. With the above sights there were no known systematic errors so the directions did not matter. It is always best to take sights that are as close to 120º apart as this will minimize these fixed errors. The interactive MPL app is a good way to study how these errors affect the MLP. Below is an example using compass bearing LOPs. These measurements are from Andrés Ruiz González who is the author of Navigational Algorithms. He has made many valuable contributions to navigators, worldwide. He posted this data in the NavL discussion forum on Dec 16, 2010. The boat was not moving. The rough sigma estimates are my own, based on target distance off and an estimated bearing uncertainty of ± 1º, sigma = distance off x tan (1º). This was a hockey puck compass, which can be read to that precision, but we never know for sure with compass bearings and subsequent plotting, variation values, etc. The vessel icon marks his stationary position from GPS. Figure 11. Compass bearing LOPs to targets with direction and distance off shown. The assigned sigma values are shown for each and shown schematically. The three sides (green, blue, red) are 0.15, 0.37, and 0.44 nmi). MLP (0.42, 0.02) is plotted as a yellow dot, relative to Q1 (0.36, 0.11). . The plot looks complex with all of these annotations, but the three distances needed to solve for MLP takes just seconds once the triad of LOPs is plotted. Below shows the solution for Px,Py by hand using the form and computed from the MLP app. 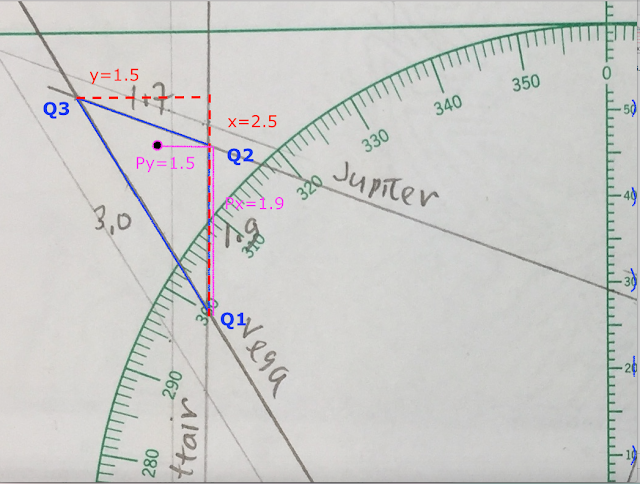 Using the form we need to measure location of Q3, shown in the figure in light magenta. Figure 12. 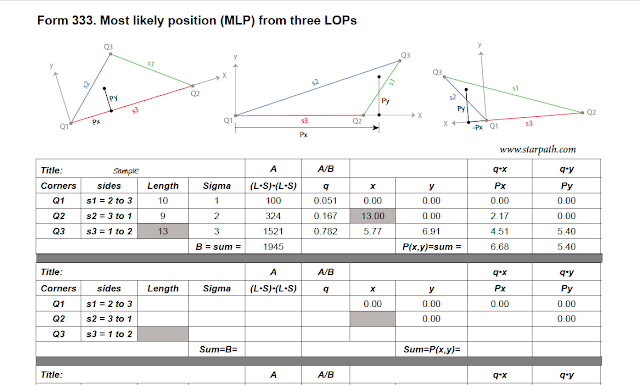 Solving MLP with a form and calculator(top), or using the digital MLP app (bottom). With the form we need to measure Q3, but this is not needed in the app, or a programed solution. The sides are named for the opposite intersection. 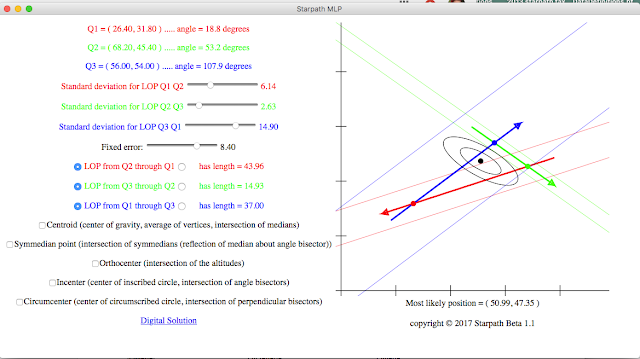 Returning to the bearing fix in Figure 11, we see the MLP is more or less as expected., essentially at the intersection of the two best LOPs, with the third one just pulling it off a bit. We learn more from the graphic app. Figure 13. The graphic solution showing MLP (black dot) and the symmedian (green dot). This version of the graphic app does not let us set digital values precisely, but the next version does. 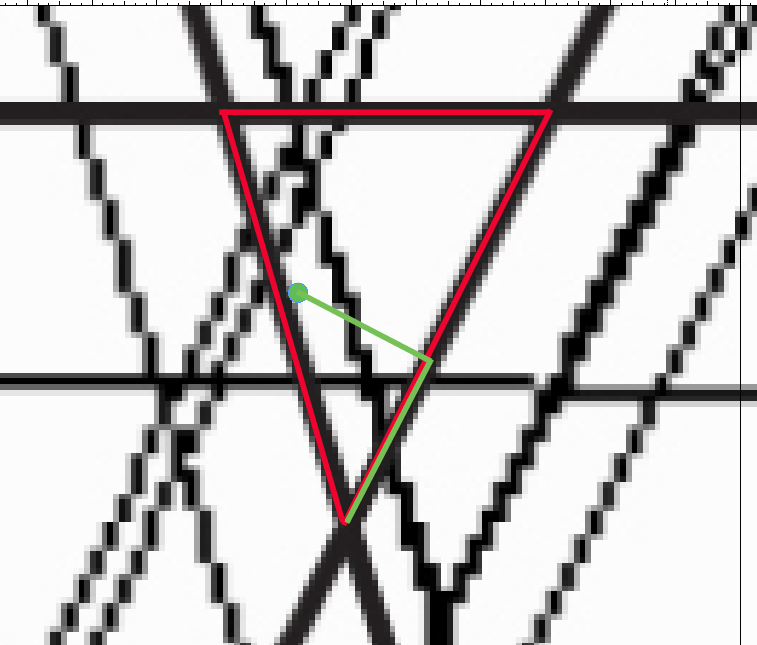 With this one we just drag corners to make a triangle and use the sliders to set sigma and fixed error. The vessel location outside of the triangle is still within the 90% probability distribution of the data as interpreted and almost within the smaller 50% range. A small (negative) systematic error pushes the MLP toward the actual vessel location, as seen below. Figure 14. Adding systematic errors. It appears that a positive fixed error is definitely in the wrong direction. The 0.08 nmi used here as a common error to each sight (all scaled by x10) corresponds very roughly to 1º error over the average distance off of the targets (4.5 nmi). We cannot be very conclusive on this specific fix without actual data for all sights, rather than just the three LOPs. However, these were taken by an experienced navigator, so even without the data recorded or available, there was certainly a mental averaging of the sights before they would be recorded, and the estimated sigmas are based on known variances in bearing LOPs. The experimental addition of a fixed error in Figures 13 and 14 do give some hint on possible further analysis—an operation that is figuratively like making a trial maneuver with ARPA! Since one of the targets was farther off than the other two, we might consider the two close ones as being valid LOPs and the farther one being an indicator of a fixed compass error, with the thought that the larger distance off exposed this error that we could not detect in bearings to the closer targets. We then assume we can estimate the fixed error by forcing the distant one to coincide with the closer ones. 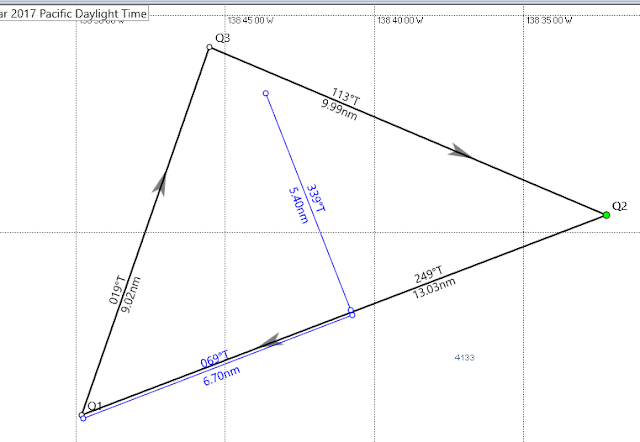 Then we correct the other two for this presumed fix error for a new triangle, as shown below. Figure 15. Using a distant sight compared to closer ones to estimate a fixed error. This pushes the triangle in the right direction, but we could also see that from the graphic app solution. The offset of the distant sight (1º) was coincidentally the same as the sigma of the assumed random errors of each sight. The other factor in bearing fixes is deviation. For careful work we need to confirm there is no deviation at the location we are when we take the sights. To check for this underway interrupts the voyage, namely we need to take a bearing a distant object standing in the same location as we swing ship. With no deviation, this bearing will remain constant on all headings. Since there are likely places to stand for such bearings, it is possible do check this ahead of time in local waters. It is more important on power-driven vessels than it is from the cockpit of a non-steel sailboat. Many aspects of bearing fixes can be practiced in your own neighborhood or marina. For land based practice you can use Google Earth to make a chart. Just about any compass will serve for practice. An example is shown below using an iPhone compass. A quick way to estimate sigma is use the small angle rule, sigma (per degree) = distance off/60. In the above case we would get, for example, 3.5 nmi/60 = 0.06. In the example below the distances are in 10's of yards. Here is an example from taken another post on Compass Bearing Fixes, along with the data of the fix given in that link. Figure 16. Bearing fix in the neighborhood. The green circle was an estimate of the sighting location plotted before the sights were taken. In retrospect, it would have been better to have been more precise documenting that at the time, which was possible, assuming integrity in the Google images. The red dot marks the MLP. The data are below. The sigmas were based on distance off and a 1º bearing uncertainty. This is discussed in the above link to this exercise, which includes the actual sight data, five sights of each target. The linked article to compass bearing fixes outlines the role bearing fixes with discussion of optimizing accuracy and the affects of uncertainty. The celestial fix link presented earlier does the same for cel nav sights. What can be done with this formalism? The interactive graphic app lets users investigate various configurations, with and without a fixed error. This lets us confirm mathematically what we know from practice, plus we learn more. For example, we know if one LOP is much better than the other two, then the fix is on that line and the other two just show us where on that line. 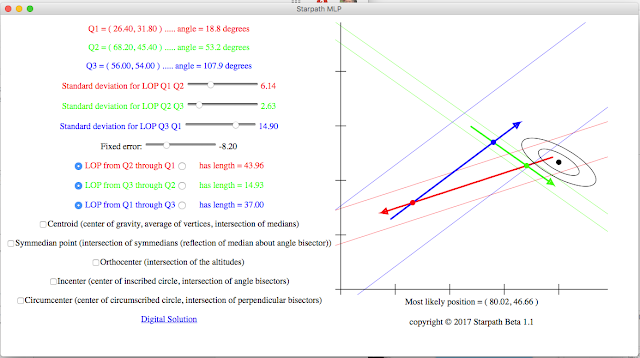 We can also demonstrate that if all sigma are the same and there is no fixed error, then the fix is at the symmedian point, or show that with three sights 120º apart, with the same sigmas, that a fixed error just makes the triangle larger, but the fix remains in the center of the triangle. Change that to three sights 60º apart and the fix is outside of the triangle, even though the triangle looks identical. Practice with the app also makes us more aware of how important it is to have some estimate of the sigmas for each line, or at least to make a decision if they are about the same or one more uncertain. This comes up in many phases of navigation. At sea the horizon could be poorer in one direction than the other, for example, or distorted by bright moon light. In piloting, we could have one bearing target less well defined than others, or we could have a range line (transit) for one of the LOPs which makes is very good, compared to compass bearings, and so on. In short, the interactive MLP app can be used to train ones intuition about choosing the MLP, so that the actual computation would not add that much underway. We can always just state such things in the classroom, or tediously plot out the variations, but now we can just drag the triangles around and vary sigmas and fixed errors to practice. We can also sometimes get indirectly an indication that there are errors we have missed. We can look at the probability distribution of the standard deviation and keep that in mind when we look at the app's graphic plot. If we have a triangle that is notably larger than the sigmas would imply, then we have indication that we may have underestimated them or that there is a fixed error we did not know about.... or maybe one of the sights has errors we did not know about. We also point that this formalism is easy to incorporate into any navigation program that is computing a fix from LOPs or sextant sights. The only new input that would be required is the sigmas for the individual targets. Then an effective radius of the 50% and 90% probability ellipses could also be computed and displayed. 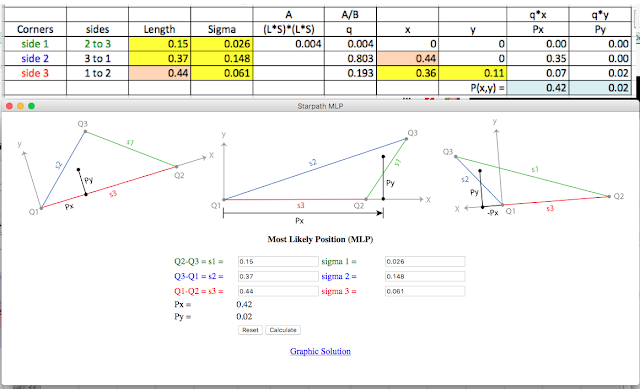 Below are for graphically manipulating triangle and variances to see solution and probabilities; includes the digital solution as well. Must be online to run the apps. In one of the references at the end of the list from the Royal Institute of Navigation (RIN), the editor says "I don't ever want to see another paper on the cocked hat." Maybe he is retired now. 00. Errors in Position Lines, Admiralty Manual of Navigation, Vol. 3 (1938), Chapter XIII. 01. Accuracy of Position Finding Using Three or Four Lines of Position, S.A. Goudsmit, 1946, ION. 03. Some Observations of Refraction at Low Altitudes and of Astronomical Position-line Accuracy, B. Chr. Peterson, 1952, RIN, Vol. V, No. 1, p. 31-38. 04. The Treatment of Navigational Errors, E. W. Anderson, 1952, ION, Vol. V, No. 2, p. 103-124. 05. The Treatment of Simultaneous Position Data in the Air, J. B. Parker, 1952, RIN, Vol. V, No. 3, p. 235-250. 06. Determining the Most Probable Position, J. B. Parker, 1953, RIN, Vol. VI, No. 1, p. 44-58. 07. Accuracy of Position Finding Using Three or Four Lines of Position, P. L. Nightingale, 1953, RIN, Vol. VI, No. 3, p. 321-324. 08. Estimating the Position, P. G. Redgment, 1953, RIN, Vol. VI, No. 3, p. 324-327. 09. The Use of Bisectors in Selecting the Most Probable Position, M. Bini, 1955, ION, Vol. VIII, No. 3, p. 195-204. 10. The Use of Bisectors, Alan Davies, 1956, RIN, Vol. IX, No. 3, p. 345-348. 11. The Cocked Hat, Charles H. Cotter, 1961, RIN, Vol. XIV, No. 2, p. 223-230. 12. The Cocked Hat, J. B. Parker, 1961, RIN, Vol. XIV, No. 4, p. 473-476. 13. Interpreting Astro-position Lines at Sea, M. W. Richey, 1962, RIN, Vol. 15, No. 3, p. 341-343. 14. Errors and Accuracy of Position, LOPS, and Fixes, T. R. Sternberg, 1963, ION, Vol. 10, No. 4, p. 379-394. 15. Contour-Based Position Lines, J. Garcia-Frias, 1967, RIN, Vol. 20, No. 2, p. 146-150. 16. On the 95 per cent Probability Circle of a Vessel’s Position - I (2 LOPs), T. Hiraiwa, 1967, RIN, Vol. 20, No. 3, p. 258-270. 17. The Franklin Piloting Technique, Ernest Brown and Byron Franklin, 1967, ION, Vol. 14, No. 2, p. 157-161. See also Bowditch, 1977, Section 1009. 18. Celestial Fix-lnternal or External?, Alton B. Moody, 1972, ION, Vol. 19, No. 4, p. 338-343. 19. Accuracy Contours for Horizontal Angle Position Lines, E. M. Goodwin and J. F. Kemp, 1973, RIN, Vol. 26, No. 4, p. 481-485. 22. On the 95 per cent Probability Circle of a Vessel’s Position - II (3 LOPs different sigma), T. Hiraiwa, 1980, RIN, Vol. 33, No. 2, p. 223-226. 23. Most Probable Fix Position Reduction, G. D. Morrison, 1981, ION, Vol. 28, No. 1, p. 1-8. 24. The Cocked Hat, L. Lee, 1991, RIN, Vol. 44, No. 3, p. 433-433. 25. The Cocked Hat, P. J. D. Gething, 1992, RIN, Vol. 45, No. 1, p. 143-143. 26. Random Cocked Hats, Ian Cook, 1993, RIN, Vol. 46, No. 1, p. 132-137. 27. A theorem of Jacobi and its generalization, Mark Berman, 1988, Biometrika, Vol. 75, No. 4, p. 779-83. 28. 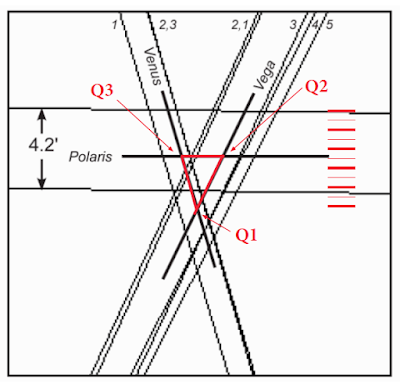 Wikipedia entry on symmdian point. 29. Wikipedia entry on triangles. 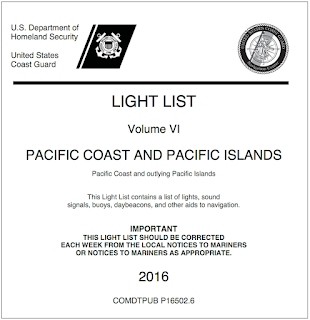 The Light List (LL) is a crucial USCG publication for navigation for several reasons. 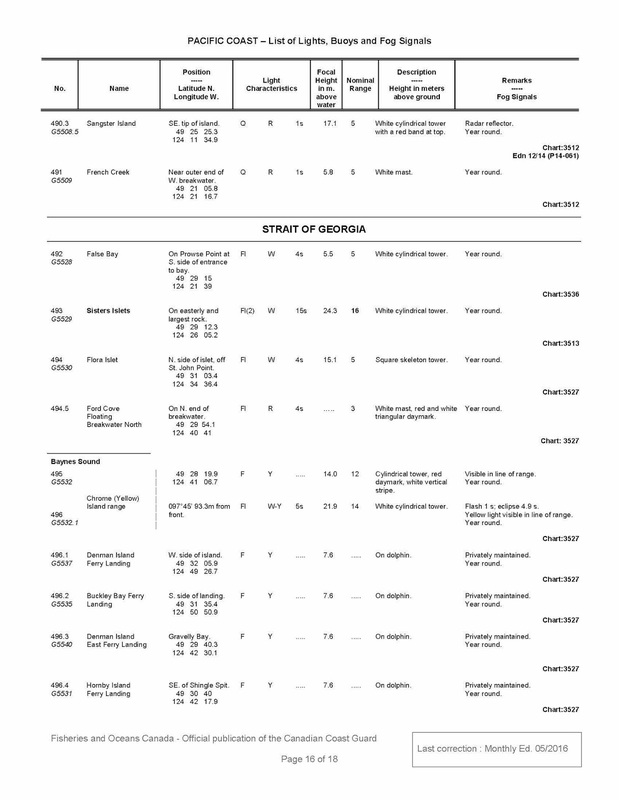 The primary one is it includes information about the aids to navigation (ATONs, ie buoys, lights, day marks, radio aids) that is often not available on nautical charts, such as the nominal range and height of some lights, and other descriptions. This is especially true when relying on paper charts or using echarts in the RNC format, which are just graphic images of the paper charts. A partial exception comes into play when using official US vector echarts (ENC) as these charts do include ATON data that are updated when the charts are updated, so in principle with automated ENC updates, you have all the latest ATON information as of about 10 days. They are updated every week, with about a 3 day processing time. Thus an updated US ENC is much like having the latest Light List on board—but we are then at the mercy of our echart program that we count on to alert us that a new edition is available. But the point of this note is not the value of the LL, but how to get it onto the boat or your phone, and to keep it up to date. The printed version is the same as it has been for years. Namely, once a year they publish an annual edition that is updated as of week 52 of the previous year. The US government no longer prints these, but private companies have picked it up and do so. They sell for about $53. The Canadian counterparts cost $30 printed, and the British Admiralty versions cost about $68. Both US and Canadian books are available as free pdf downloads, but not the Admiralty products. The point to stress here is this link gets you the full book, introduction and data, but it is not updated. This download will be the version of the LL that was up to date at the end of the previous year, ie week 52 of 2015. You get the same product here downloading in April as you would in November. You have two ways to keep this Annual LL up to date. You can download just the changes that have occurred this calendar year since the annual edition was published, or you can download the full book as of the week of the download, but this file will not include the important front matter mentioned above. Using this solution you would have to have a copy of the annual edition as these are just the changes. These are small files (~250 kb). The practical application would be look up your light in the annual edition then do a quick check in the updates file. You can do this fairly quickly because every ATON in US waters has a unique number, and that number is listed on the left of every entry, ie for ebook editions we just search on that number. (3) Updated editions with optional front matter. This seems a good approach. Just download the front matter once (~3 Mb) to have this important info somewhere available to you, then download the full set of data as needed to keep your LL up to date in one file. Then when underway you have just one file to look at. These files are about 800 kb. The date of each of these is printed next to the download link in terms of weeks. The one I am looking at now is called Week 26 of 2016. Week 26 is June 27 to July 3, so this being the 4th is right. Again, the weekly updates can be up to 3 days late. 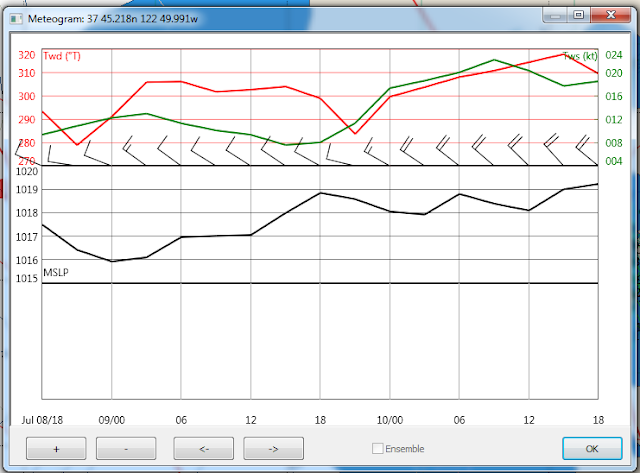 It is also shown on each page of data as shown below. When leaving for a trip, go to link (3) download both files (front matter and latest contents) and you are done. You have the front matter and you have the LL up to date at the time you leave. That is the best we can do. 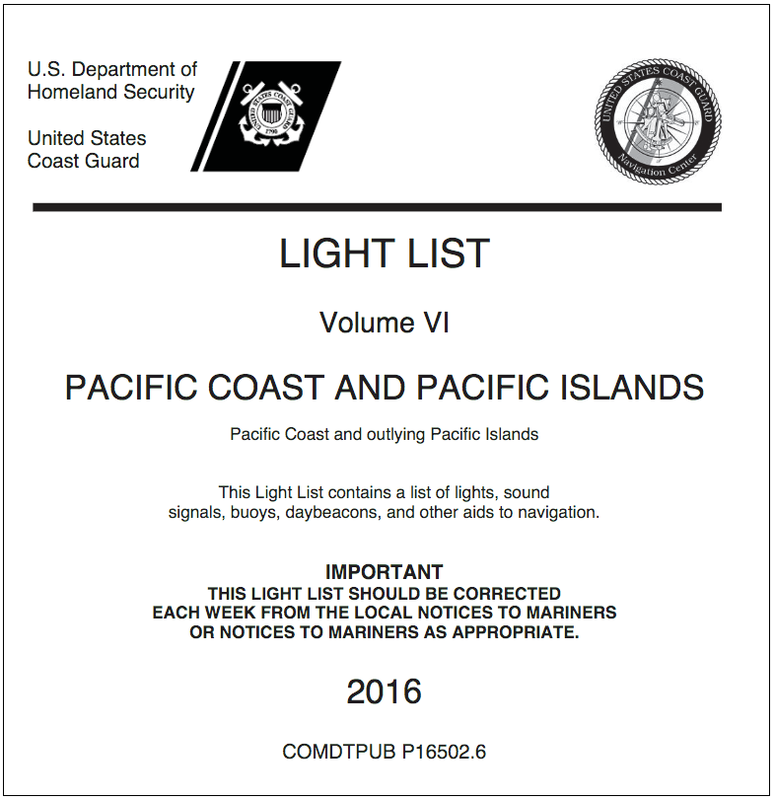 If a crucial light does change once we are underway, then we can hope that it is reported by the USCG on their twice daily VHF broadcasts of the Notice to Mariners. They announce this on channel 16 then give the reports on 22A. Publication 117 Radio Aids to Navigation tells when these are broadcasted if we want to focus on that without relying on the channel 16 announcement. This is actually a wonderful service that you can try now, and then see how it might work for you with your onboard email service. 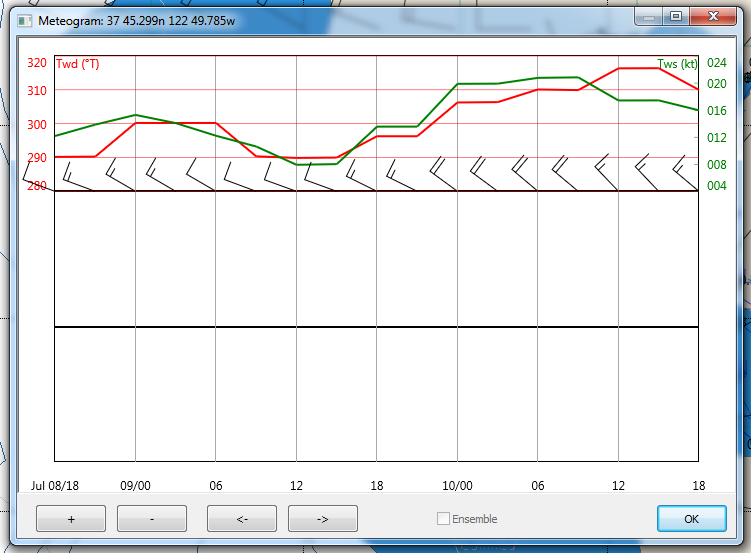 It will also tell you when chart updates are available or other maritime notices... ie Navy bombing practice. The Canadian books are also available with front matter and index separated from the main data, plus they offer the option to choose just the regional parts you need. Thus when traversing Canadian waters as in the R2AK, you would select the regions needed and combine them for a custom version. 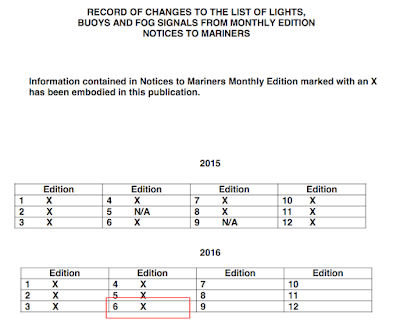 The Canadian LL is in principle updated monthly, but it is sometimes delayed as it must be released by the Canadian Coast Guard, which is a different agency than makes the actual updates. ...but the actual pages in this section are each marked as last updated 5/16. And when we check the front matter section, we get a bolder statement, with a still different date of 6/16. 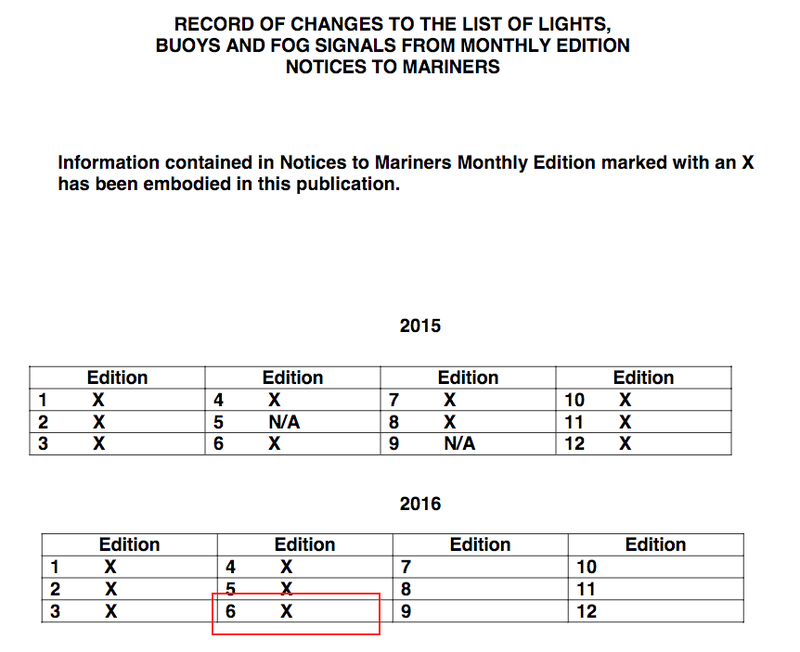 Thus for our "truth meter" for deciding which light data were right in the short course, we can assign June, 2016 to the Canadian LL data. It is another matter to track down the date of latest ATON data included with commercial echart programs that offer Canadian vector charts such as Navionics, C-map, Garmin BlueChart, MapMedia, and others. These companies have a license to reproduce the charts, but no obligation to keep them up to date. When they do an update, we do not know what has been updated or what was the latest official chart was used. Some of these companies are known to be slow on updates, and in many of their apps you simply cannot tell what the latest edition actually is. I have earlier addressed an issue related to that: Don't Blame eCharts for Anything. Side note on ENC vs RNC. We have several places pointed out the value of having ENC charts installed, even if you prefer routine navigation with RNC, because they are more familiar looking. The interesting thing I have learned is Canadian printed charts (now all Print on Demand) are also updated weekly, just as the US ones are, but the Canadian RNC made from these printed charts are much delayed, being at most once a month, and often longer. They are not updated until the Canadian Light List is updated, which is on a monthly schedule, but often delayed as noted above. Thus they hold off on updating the RNC until the Light List is issued. Put another way, with Canadian charts we have the unusual circumstance where the printed chart could be up to a month or more newer than the RNC that represents it, which is one more argument to have both the ENC and the RNC. Not only does the ENC sometimes add data to the description of the aids, it is almost certainly up to date if latest chart has been installed (which is not the case for the RNC). 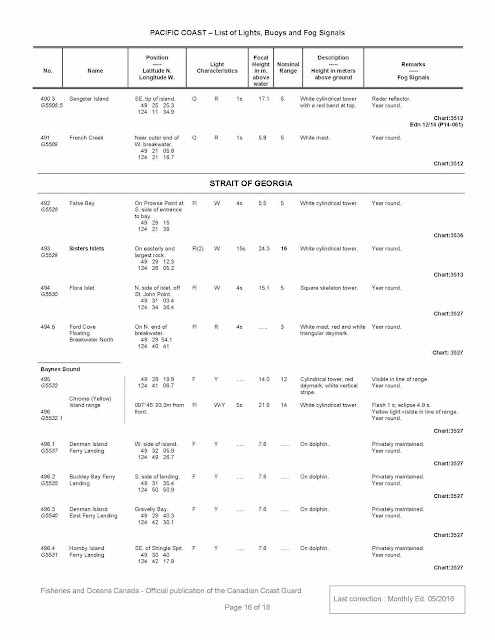 To be sure you have the latest chart editions at departure, you can download these pdf files. For the US, we can assume that all formats are updated at the same time; for Canadian charts as noted above the printed charts can be earlier than the echarts. For an extended discussion of how to use the Light List see Inland and Coastal Navigation. The Light List is structured in a unique way, separating main waterways and secondary, and sometimes a light on the corner of these is tricky to find if we do not know its name, or it does not have a name. What we do know is, all lights and buoys are in there, somewhere, and each has a unique number. A special thanks to the Canadian Department of Fisheries and Oceans, CHS, NOTMAR Division in Victoria for their useful information on details of charting and chart publication. No matter how sophisticated our navigation electronics might be, safe navigation at night boils down to keeping track visually of where you are relative to navigation lights—on buoys, lighthouses, or posts in the water. Efficiency is also at stake when you have limited navigation aids on the boat or aids to navigation on the waterway. You might turn into the wrong channel or miss the one you want if you misjudge when certain lights should or should not be visible. We have more in-depth treatments of this important topic in the book Inland and Coastal Navigation, but we present here the short version that we prepared for the R2AK team for a quick review, which accounts for examples from Canadian waters. Visible range (VR) is how far off in nautical miles you can see the light from your elevation. Luminous range (LR) is the effective nominal range when the atmospheric visibility is not 10 nmi. h = our height in feet above the water level. 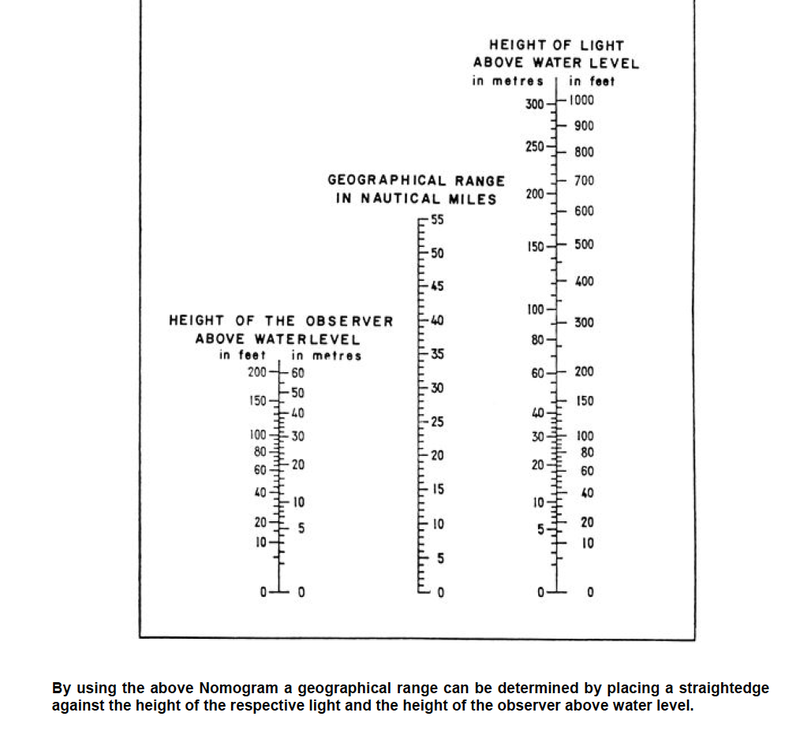 H = charted height (ft) of the light above MHW… not often do navigators account for tides in these computations but in extreme cases they could dominate the answer. • VR is the smaller of GR and NR to the light. 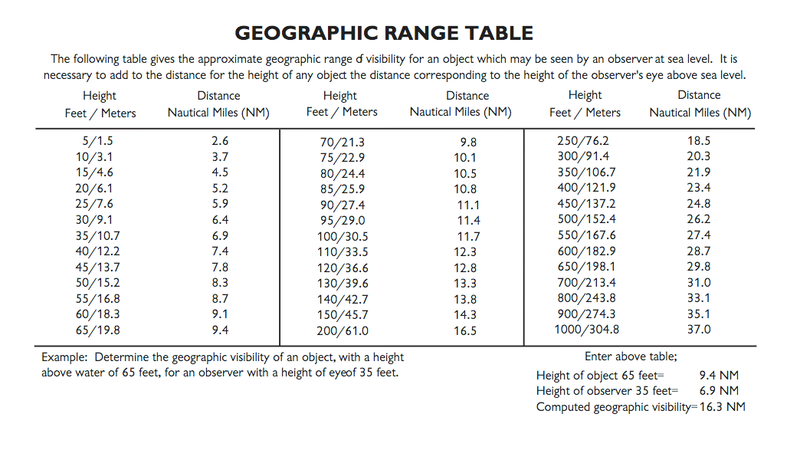 We can look up NR, but we must compute GR as it depends on h and H.
• NR is on the chart, or failing that we find it in the Light List, which is available for US and Canadian waters in pdf format. US Light List for AK. Canadian Light List for Pacific Coast (need several parts)... doesn't every navigator want to have the Light List in their phone? • GR (nmi) = SQRT (h) + SQRT (H). GR Notes. There are tables in the Light List that list GR for various values of height, from which you find the value for you and for the light and add them, but the height steps are generally too large to be useful for small craft. Sample at the end here. The CND Light List has a nomogram to determine GR based on h and H, but again, this is an easy computation for better results. Both of these solutions are presented at the end here, but a phone calculator is best solution. Sample at the end here. Also, when comparing those published solutions you will note that our formula gives a smaller value, i.e. the official solution has a factor of 1.17 in front of it, so our GR is 17% shorter. Our value is easier to remember and usually more accurate. The slightest chop on the water will reduce this value by that much, not to mention that the entire analysis is not better than ±10% or so, not even counting the effect of Luminous range. On the other hand, omitting the effect of tide can have a large error for cases where H is relatively low (under say 50 ft) and the tide range is large (over 10 ft or so). Refer to the "long course" notes for sorting that out. Assume your h = 9 ft, so GR will always be SQRT (H) + 3 nmi. A light that is 25 ft high has a GR = SQRT (25) + 3 = 8 nmi. If the NR to light in question is 6 nmi, then you will not see it till you are within 6 nmi. In other words, the light is well over the horizon (on a clear day with binoculars you might be able to see the lighthouse in daylight), but the light is not bright enough to see it at night till you get to 6 mi off. On the other hand, if the NR is 13 nmi, then you will not see it till you are within 8 nmi. That is, it is shining out into space a distance of 13 nmi, but is below the horizon till you are within 8 nmi of the light. Look up the NR form chart of Light List; then compute the GR from h and H, and then VR (when you see the light), will be the smaller of the two. You will see it closer than this visible range, but not farther. Your h is not always constant, depending on your boat. You can look from the cockpit, or from the deck, or from standing on the boom, etc. It is beyond this “short course” to investigate what it means when you see the light standing on the boom, then jump back in the cockpit to tell your mates, and you can no longer see it. Back up on the boom, and it is there again. Hint: it is called bobbing a light. With no color given we can usually assume white. But to figure how close we have to be to see this takes more work because we do not know how high or bright it is from the chart, i.e. we do not know GR or NR from the chart in this case. We see for this light (using h = 9 ft… i.e. a sailor standing on the deck of M32x on the way to Ketchikan)! Note our formula uses feet, but the Canadian tables are in meters, which accounts for the 3.28 factor. A little practice with a cell phone calculator makes this very fast. The NR of this light is listed as 5 nmi, i.e. which is smaller than the GR, so the VR of this light is limited by its brightness; you will not see it till you are some 5 mi off. These are ±10% type numbers, maybe ± 15%. Answer: Visible range = 5 nmi. Now you can go on the chart, but a waypoint at that light, and then a range ring on that waypoint with radius of 5 nmi to show clearly when you will see it. This is illustrated in the video below. We also see Sisters Is light in the raster chart (RNC) above marked as: Fl (2) 15s 21m 21 M. In the Light List we learn that this group flashing light has a period of 15s, same as on the chart, meaning that is how long it takes the pattern to repeat, not the time between flashes This would imply the light is 21 m high (69 ft) with nominal range of 21 nmi. However, it appears that this latest version of the Canadian raster chart (RNC) is not correct. We have to assume the Light List is correct. 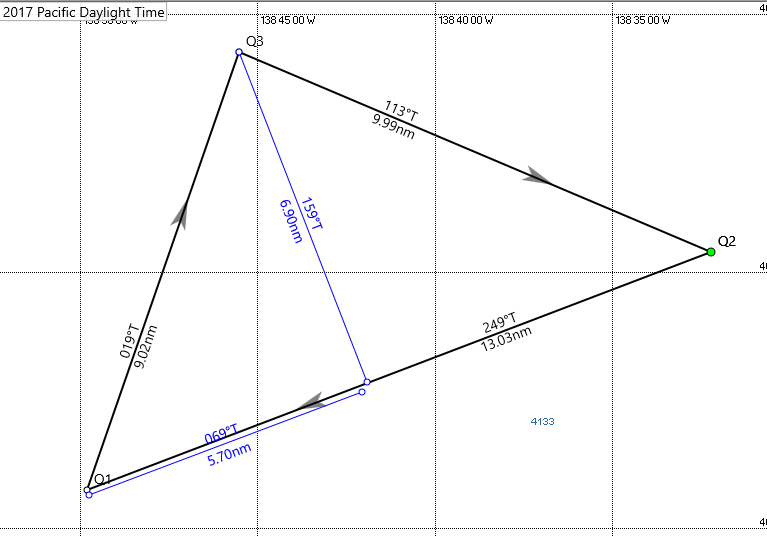 It says 24.3 m high = 80 ft, with a nominal range of 16, not 18. That is the virtue of the Light List. Refer to the Truth Meter at the end here. Note that the latest official Canadian vector chart (ENC) shown below has it right, or at least consistent with the Light List. It is much easier for an agency on a budget to keep the vector charts (ENC) updated compared to the RNC, which are copies of the printed charts. 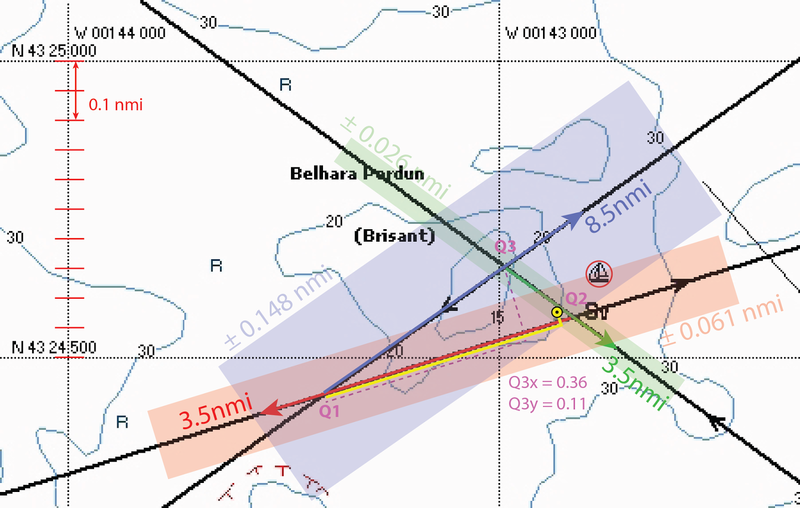 We compare these to the latest Navionics charts below. This vector chart, however, has the False Bay NR wrong, i.e. shows 6 but Light List says 5. Back to the Truth Meter. So for Sisters Is. Light GR= 3 nmi + SQRT(80) = about 12 nmi. Its NR = 16, so in this case the visibility of this light is limited by our low perspective. For most small boats looking at bright lights it will be the GR that is the limitation. Answer: VR = 12 nmi. Below shows how me might plot these on a paper or echart to keep track of VR. The red circle shows range of False Bay Light; blue circle is range to Sisters Is Light. So we should see Sisters Is Light not far beyond the Ballenas Is waypoint, headed NW, and if the route ended up along the southern shore, you would not see the False Bay Light at all. The faint colored lines are the tracks of a few boats from the 2015 R2AK. End of Lesson. To follow are a few background pics. Here is a table of light characteristics from the US Light List. The notes above propose computing directly, but some navigators (in more comfortable conditions than on an M32x) might prefer to just have this table handy and use it. Here is the Canadian solution to the GR computation, but this definitely requires a nav station. 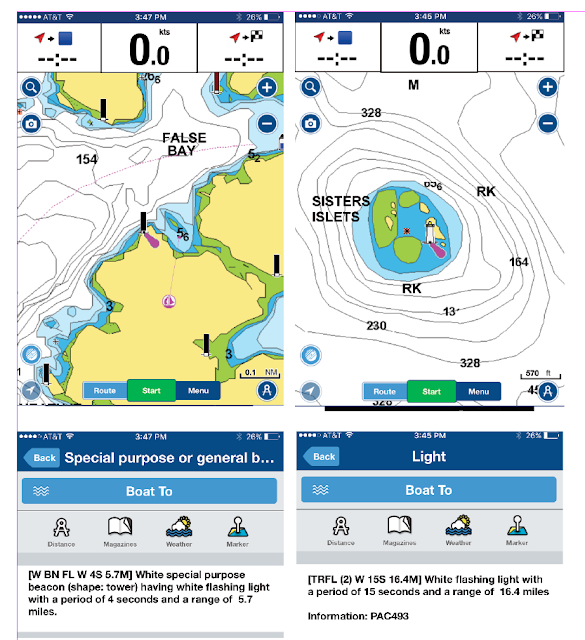 Here are the displays of these lights in the Navionics app called Boating US and Canada, which is quite a good bargain and the charts seem pretty good. It sells for $16, whereas the full set of Canadian echarts that can be run in any echart program costs $199 each for RNC and ENC. Rose Point has a nice set for $99 each that run in Coastal Explorer. For this race we made the routes in Coastal Explorer and then transferred them to both the Garmin 78s and the Navionics App... both of these processes takes some hokey pokey that I will write up in the near future. The only thing left to add is the "Truth meter" table that compares dates of all these resources, which agree fairly well, but not precisely. [*] It is not clear if this fundamental observation was early enough to have prevented the grounding had he responded to her first alert, or if maybe had they all looked more closely to lights on the horizon earlier it might have been prevented, but it was indeed awareness of where the light should be by one person that told everyone they were in trouble. She was sailing as an AB, but actually had a Third Mate License of her own. These notes are from published testimony. I have no special knowledge of this incident nor of the the people involved.